World Mission Society Church of God, is a new religious movement that began in South Korea in 1964. After founder Ahn Sahng-hong died in 1985, the Church expanded its activities to other parts of the world and began to use the name World Mission Society Church of God. Its headquarters are located in Bundang, Sungnam City, Kyunggi Province. The church believes in Christ Ahn Sahng-hong and God the Mother, and that it is restoring the truth of the early church. World Mission Society Church of God, or the Church of God, is the name used identically in affiliated churches distributed in Europe, Asia, Africa, Oceania, North America and South America. The church was founded in South Korea on April 28, 1964 by Ahn Sahng-hong. Ahn Sahng-hong died in February 1985, and afterward the church, later renamed Church of God World Mission Society, was administered by Kim Joo-cheol and Jang Gil-ja. A media outlet owned by the Church of God reports to have more than 7,000 churches in 175 countries. An external account mentions that the number of church members is estimated to have only been around 100,000 in 2013, contrary to Kim Joo-cheol's claims. The church believes in God the Father and God the Mother, claiming to be restoring the truth and practices of the early Church. The church also believes that co-founder Zang Gil-ja is God the Mother, as taught by the founder Ahn Sahng-hong. The World Mission Society Church of God believes that all of its teachings are based on the Bible, as explained in the numerous books written by Ahn Sahng-hong. The Church believes that Jesus was to come a second time in the flesh. They believe that Ahn Sahng-hong is the Second Coming Jesus, who came with a new name, the name of the Holy Spirit. (Revelation 3:11–12 and Revelation 2:17), and it states that he fulfilled biblical prophecies that only Jesus could have fulfilled. The church celebrates the seven feasts laid in Leviticus 23: Passover, Unleavened Bread, First Fruits, Feast of Weeks, Feast of Trumpets, Day of Atonement, and Feast of Tabernacles. The church observes the feasts according to the New Covenant established by Jesus by distinguishing from the feasts kept in the Old Testament. It believes in the Saturday Sabbath according to Genesis 2:1 but celebrates it not from sunset to sunset but from sunrise to sunset. It considers the Sabbath to be a sign between God and God's people according to (Ezekiel 20:12, Exodus 31:13), and it must be kept as a service according to (Luke 4:16). Members are encouraged to keep the three services on the Sabbath day. Between services, members participate in various church-related activities such as Bible studies, watching church produced videos, or preaching in the local community. According to the church's interpretation of Exodus 20:4, items such as crosses, statues and stained glass are considered a form of idolatry and are not erected on or in their churches. The Church believes that all human beings were originally created as angels in Heaven. They sinned against God and were sent to the earth as a second chance to return to God. The only way for humans to return to heaven is by keeping the Passover with bread and wine (Jesus' flesh and blood) and following the teachings of the Bible, as taught by Ahn Sahng-hong. They include believing in God the Mother, who is the Bride to give them life in the last days. The World Mission Society Church of God holds that baptism is the first step towards salvation and must be done in the name of the Father (Jehovah), of the Son (Jesus), and the name of the Holy Spirit, Ahn Sahng-hong. The Church believes that prayer must be done in the name of the Holy Spirit Ahn Sahng-hong in the last days and that women must wear veils, according to 1 Corinthians 11:1–16 while they pray. Members travel from house to house and in shopping malls, hospitals and college campuses to share their beliefs in the bible. Critics note that the group's recruiting efforts can be very aggressive, and target vulnerable people, especially those going through a major life transition or with a void in their lives. Some have alleged that the group targets those with greater access to money. College students and returning veterans have been particularly targeted. Some aggressive WMSCOG recruiters have created concern on college campuses, where young women seem to be their primary target, proseletyzed emphatically with the church's "Mother God" idea; some "aggressive" WMSCOG recruiters have been banned from some college campuses in the U.S. for "trespassing" or proselytizing without permission. Responding to an inquiry, the WMSCOG issued a statement that "the biggest difference between our Church and other churches" is that "we believe in God the Mother as well as God the Father. … According to the prophecies of the Bible, God the Mother is to appear in the last age of redemption." A Korean Christian umbrella organization, the Christian Council of Korea, which represents Protestant churches in South Korea, has denounced the WMSCOG as "heretical." UK ZION, a World Mission Society Church of God chapter, was awarded The Queen's Award for Voluntary Service in 2016. The group has been publicly criticized -- by some former members and cult researchers -- as acting like a cult, exercising unusual control over its members, separating them from family and friends, and exploiting them excessively, while violating laws and avoiding transparency and accountability. In December 2015, People magazine published an interview with former member Michele Colon, who had attended the WMSCOG church in Ridgewood, New Jersey for two years, and later sued the organization. Colon, who was generally contradicted by the church but generally corroborated in interviews with six other former WMSCOG members, described the WMSCOG as a "doomsday cult" that is "opportunistic." She said they try to recruit people who are going through a life transition period, or have a void in their lives "and they will fill it." She said WMSCOG manipulated members with "fear and guilt," and constant repetitions. She reported that the church "micromanaged" her life, and expected that all her time be spent there, controlling her music-listening and forbidding her from using the internet. Colon said church leaders don't tell members, until they seem fully committed, that their "God the Mother" is actually a living South Korean woman in her 70s, known by multiple names and various spiritual titles, who is apparently the widow of the deceased founder, Ahnsahnghong. At least one former member has sued them for urging her to have an abortion, and others have accused the church of discouraging pregnancy in anticipation that the world would end in 2012. 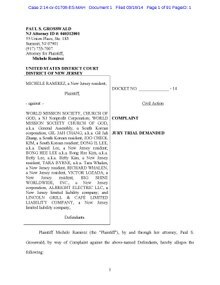 Michele Colon, a nurse from New Jersey, claimed, in a civil suit filed against WMSCOG in New Jersey, in 2013, that the group is a “profit-making” cult, and claimed it "uses a number of psychological control tactics … to prevent its members from exposing its criminal and tortious behavior." Each claim springs from Colón's contention that WMSCOG is a cult, not a church, and that she was essentially defrauded by this cult. The conflict arises from her disagreement about the manner in which the church implemented its doctrinal beliefs, managed its clergy and parishioners, and invested donations. Therefore Colón's complaint necessarily required the court to examine the interior workings and structure of the church, a constitutionally unacceptable process. Rick Alan Ross, prominent and controversial cult researcher, "deprogrammer," and federal government consultant on authoritarian groups, and director of the Cult Education Institute -- describes the WMSCOG as "a very intense group... similar to the Unification Church [of] Sun Myung Moon -- the "Moonies" -- comparing WMSCOG indoctrination methods to those of the Unification Church (which, like WMSCOG, originated in Korea). Ross claims that the WMSCOG has driven members into "bankruptcies because of excessive donations," and claims that some have lost their jobs to "excessive demands" of the group and associated "sleep deprivation.” He says that members often are sent to group housing and shared apartments, becoming isolated and alienated from family and friends, even spouses and adult children. Ross notes the group, which recruits members on university campuses, at malls and other shopping sites, has no meaningful accountability for leadership - a "dictatorship in Korea" - nor for the millions in revenue it receives. In Vietnam, the Committee for Religious Affairs urged alertness about the group, and cautioned that it should not be equated with other Protestant groups using similar names. Describing the organization as cult-like, the government cited the group as engaging in deceptive recruitment, with questionable and manipulative indoctrination, doomsday predictions, and urging the donation of cash and members' abandonment of their own families. ^ a b "WATV". WATV. Retrieved 4 April 2013. ^ "WATV – History". WATV.org. Archived from the original on 15 August 2013. Retrieved 3 June 2013. ^ "WATV Welcome – Worldwide Status". WATVWelcome.org. More than 7,000 churches in 175 countries deliver Mother’s heartwarming love to seven billion people. ^ "WATV – Second Coming Christ". WATV. World Mission Society Church of God. Retrieved 2013-03-18. ^ "WATV – Feasts of God". World Mission Society Church of God. Retrieved 2013-03-18. ^ a b "WATV – Fundamentals". World Mission Society Church of God. Retrieved 2013-03-18. ^ "WMSCOG Bible Q&A". World Mission Society Church of God. Retrieved 2013-05-24. ^ Lydia DePillis (2012-05-23). "Broken Windows Theory". Washington City Newspaper. Retrieved 2018-04-23. ^ "WATV – About Soul". World Mission Society Church of God. Retrieved 2013-03-18. ^ "World Mission Society Church of God". english.watv.org. ^ "No. 61599". The London Gazette (Supplement). June 1, 2016. p. J4. ^ "Queen's Award for Voluntary Service recipients 2016"". GOV.UK. 2 June 2016. Retrieved March 5, 2019. ^ a b "NBC Investigates - World Mission Church of God member John Power," Dec 4, 2016, The Today Show, host Ronan Farrow, NBC News on YouTube. ^ "The Intl. WeLoveU Foundation". The Intl. WeLoveU Foundation. ^ "ASEZ". ASEZ. Retrieved 14 February 2019. World Mission Society Church of God page, Cult Education Institute. "NBC Investigates - World Mission Church of God...," Dec 4, 2016, The Today Show, host Ronan Farrow - NBC News on YouTube.